Between The Avengers becoming the third-highest-grossing movie of all time and the resounding success of their “soft reboot” Marvel NOW! initiative, Marvel’s been on top of the comics world of late. 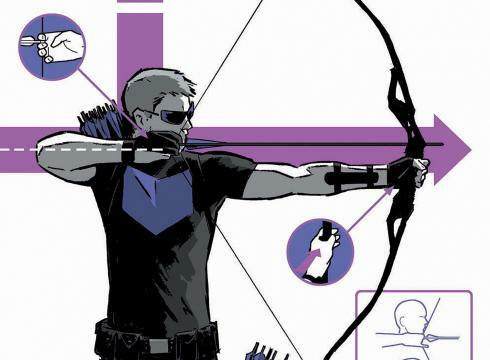 With Matt Fraction’s Hawkeye, they had on their hands perhaps the most critically adored superhero book on the market. A week ago, they published another book that quickly usurped it: Kieron Gillen’s much-anticipated Young Avengers. The typically glowing reviews for both books bring up a recurring phrase: “indie sensibility.” The creators are said to bring this particular sensibility to their books, and the prevailing narrative right now is that this sensibility is why these comics are so good. Industry hub Comic Book Resources even published an op-ed on why Young Avengers was the future of mainstream comics after only one issue. There’s always been a certain lack of clarity on precisely what “indie” is supposed to mean, and the waters are no less turbid in comics. A literal, dictionary-type definition says that in this context it would mean anything not to do with Marvel or DC, comics’ Big Two. But that casts a very wide net, and plenty of those non-Big Two publishers put out material similar in tone and content to their mainstream counterparts. The aspects of these two titles (and others like them) that make them stand out, I advance, are about direction, not content. Specifically: books like Hawkeye and Young Avengers are driven by their creators, not the editorial staff. This isn’t meant to be a diatribe about meddling executives who just won’t leave poor artists alone (although I’m sure that column will pop up on here eventually). But mainstream comics are perhaps the most staid medium there is, the ultimate example of providing an illusion of change instead of the real thing. Captain America made headlines when he took two to the gut back in ‘07, but longtime fans shrugged. In the world of superhero comic books, death’s door is a revolving one. As the old saying once went, “In comics, only Jason Todd, Bucky, and Uncle Ben stay dead.” And I say “went” because since that saying was coined, only Uncle Ben’s grave has remained undisturbed. Obviously, I’m not privy to Marvel’s exact editorial process. But the issues of Hawkeye and Young Avengers that have been published so far bear the indelible marks of their creative teams. Reading them doesn’t feel like the Extruded Superhero Product that you often see on the shelves; the books have a clear point of view, a deft way of expressing them, and a sense that not another person on Earth could have delivered you the same experience. A lot of this comes from a truthfulness inherent in the storytelling. Young Avengers uses previously-established characters in a fictional universe over half a century old, and yet the choices Gillen’s made allow his ideas about what it means to be eighteen to shine through as clearly as Brian K. Vaughan’s notions on parenthood do in his creator-owned title Saga. Which isn’t to say that more high-profile books like Superior Spider-Man or any given X-title don’t have their own truths to tell, but their messages of responsibility and acceptance have become institutions built into the characters themselves and whatever titles might feature them. Maybe part of the magic of Fraction’s and Gillen’s work comes from their use of characters who historically haven’t received as much time front and center, but whatever the reason, each issue of theirs I’ve read so far feels like a personal statement in a way a given issue of X-Factor hasn’t been for me in a very long time. So is that really it? “Indie” in comics just means a more auteurist philosophy to guide it? The illusory change to which I referred above is the main thing that leaves me cold on superhero books. The stakes of a given story are high in the moment, but knowing how quickly it can all be invalidated merely creates stakes on steroids instead of organically grown climaxes. And Hawkeye and Young Avengers will inevitably succumb to the same fate if they cross over to institutional status. But for now, these books’ creators aren’t putting out issues just for the sake of putting out issues. They’ve got ideas, and the things they’re writing and drawing are in service of those ideas and nothing else. And for my money, it doesn’t get more indie than that.